The Best Way to Experience Saint Augustine! BOOKING NOW! Spring Break… Food Tours, Pub Crawls and Historic Walking Tours! 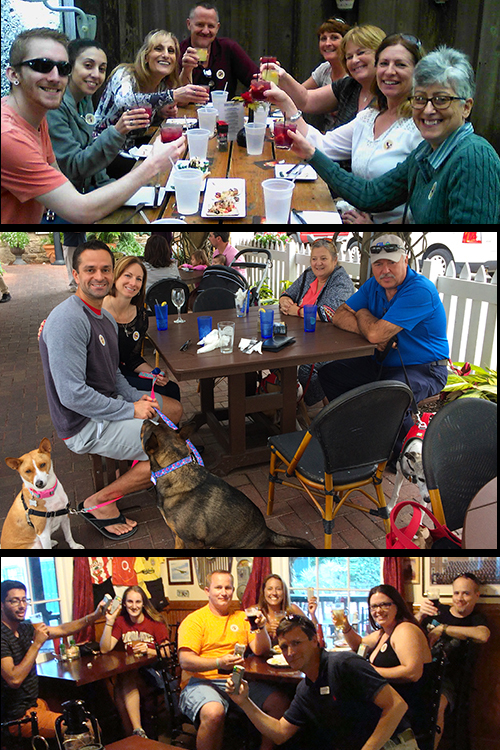 The Saint Augustine Food Tour – our owner helped to develop the very first food tour in town and we know how to do it right. The Historic Pub Crawl – history and adult beverages. We give you lots of history & great bars on this tour. Spirits with Spirits – A Paranormal Pub Crawl – Learn about our haunted history and visit some of the local’s favorite pubs and taverns. St Augustine Scavenger Hunts – Try our Lover’s Scavenger Hunt or Family-Friendly Historic Scavenger Hunt! Download yours today! We continue to be rated the #1 Walking Tour Company in Saint Augustine on Trip Advisor, the world’s largest travel site. We give you the best tours in town with the best guides in town. Join us on the best Culinary tour in St Augustine. We stop at 5 different restaurants on each tour with other fun foodie stops along the way. We promise that you won’t be hungry after this tour! The best way to “Drink in the History” of St Augustine is with an adult beverage & a fun tour guide. Your licensed guide will entertain you with drinking customs, history of St Augustine & even the history of each pub that you visit. A fun-filled paranormal investigation of some of St. Augustine’s haunted bars & taverns. Learn to use real paranormal investigative equipment as you navigate the streets of this historic city on this creepy haunted pub crawl. Bringing your four-legged friend with you to St. Augustine? You don’t want to have to leave then at the hotel or B&B. Bring them on one of our Pet-Friendly tours. Drink with a Real Pirate while they regale you with adventurous tales from the golden age of piracy! Select from the Romantic History Pub Crawl, the Pirate Pub Crawl, Spirits with Spirits – A Paranormal Pub Crawl, the St Augustine Beer Experience or the Bachelorette Scavenger Hunt. Ask about private parties. “When we travel we usually try to schedule a Food/History Tour when available. We have had the good fortune of participating in numerous tours in the last few years and this tour, along with our guide, Lynn, rates at the top!!! The food was great and our guide was very knowledgeable about the history and made it very enjoyable! St. Augustine Historic Walking Tours, LLC is registered with the State of Florida as a Seller of Travel. Registration No. ST41411.